Comments are a great tool to collaborate on a presentation. Best of all, they’re a cinch to use. 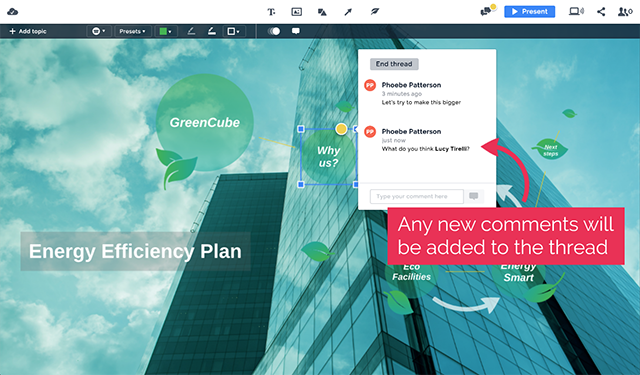 The comments feature is an effective way to give feedback and discuss particular elements of your presentation. 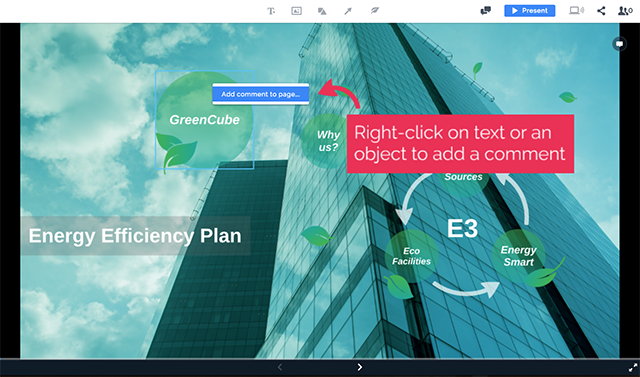 A collaborator who has commenting or editing rights to a presentation can add comments, so collaboration is simpler and more efficient. Before anyone can add a comment, you need to give commenting rights to a user. This can be done by adding them as a collaborator that has commenting or editing rights. Comments can be added to basically any part of your presentations’s structure: the overview, topics, connectors, subtopics, objects, and text. Once you choose to add a comment, you’ll get a pop-up window indicating where on the presentation your comment is being made. 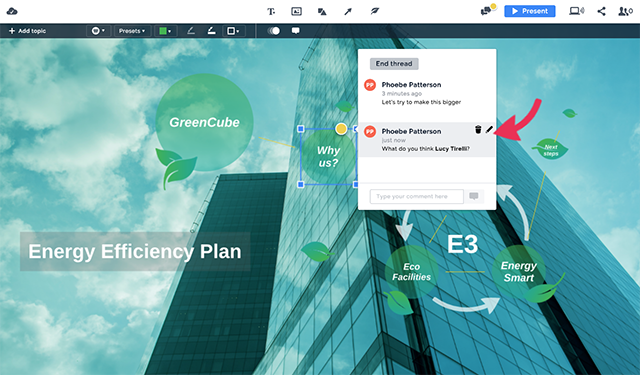 Type your comment in the field and hit ENTER. You’ll see your comment appear at the top. Use the “@” symbol to tag a user in the comment. You can tag anyone who has commenting or editing rights or is on your team. 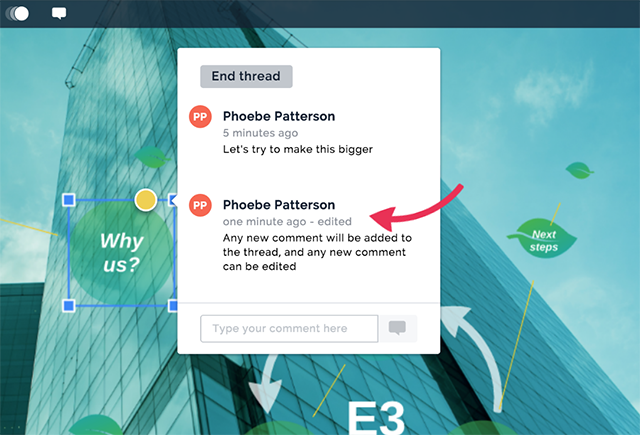 Anyone you tag in a comment will be notified by email or, if integration has been added, by Slack. 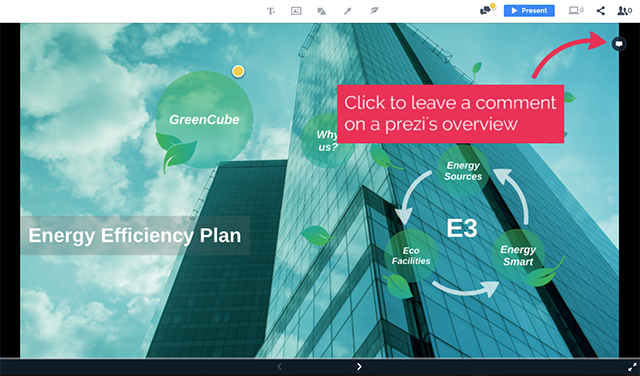 Any user who has permission to edit or comment on the presentation can add or reply to a comment. 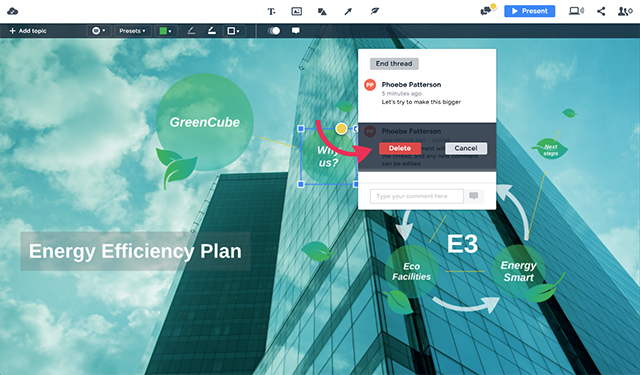 If a presentation has any comments, all users tagged in that comment will be notified and a yellow dot will appear wherever a comment has been made on the presentation. You can see the comment history by clicking on the “Comments” icon in the top toolbar. This will tell you when and where a comment was made. Click on an entry, and you’ll be taken to that particular area. 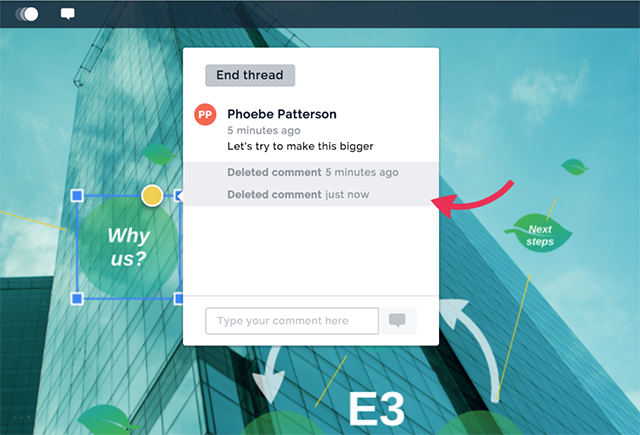 When you’re ready to end a comment thread, simply click End thread in the comment pop-up. This will remove the yellow dot on the object or area. If you’d like to reopen the thread, just click on the same area and add another comment. You’ll see your new comment appear below the existing comments in the original thread. 1. Hover over the comment. You’ll see trash and pencil icons. 3. 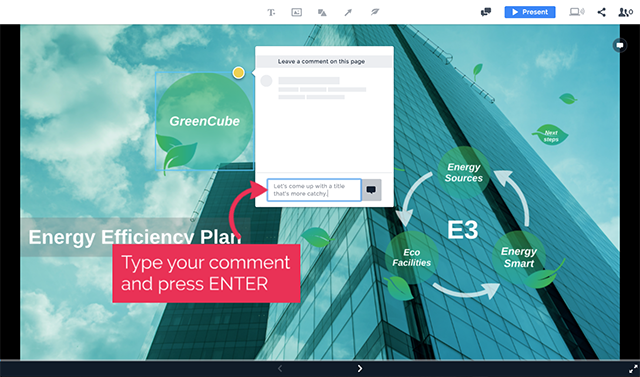 Enter the new comment in the field and hit ENTER on your keyboard. 4. You’ll see an indication that the comment was edited in the pop-up. 2. Click on the trash icon. 3. Click Delete to completely erase your comment. 4. You’ll see an indication that the comment was deleted in the pop-up. 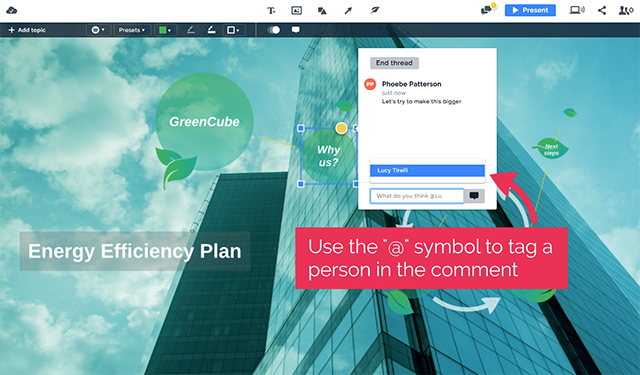 If you have commenting rights, you can add comments to topics and objects. 1. 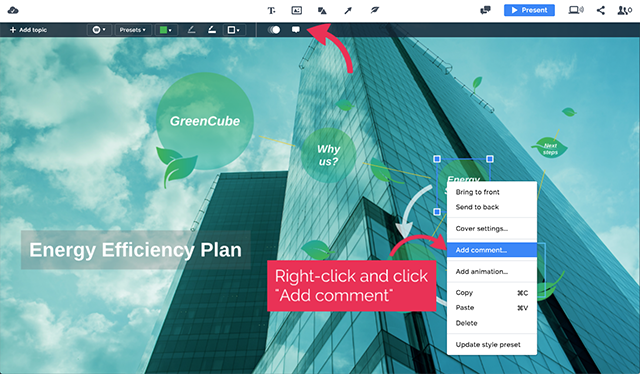 In your dashboard, rollover the presentation you want to add comments to, and click Present. 2. 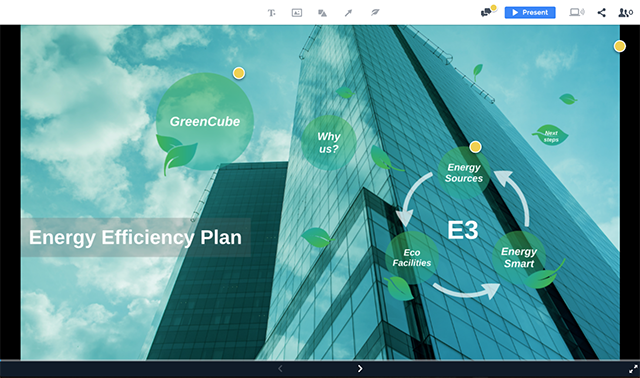 Once the presentation loads, tap the ESC key to exit full screen. 3. Right-click on text or an object to add a comment to it. 4. Add your comment in the field and press ENTER. 5. 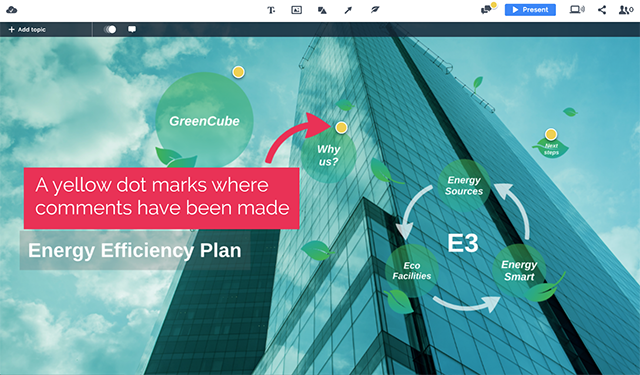 Click the comment bubble icon in the upper right corner to leave a comment on the overview. 1. 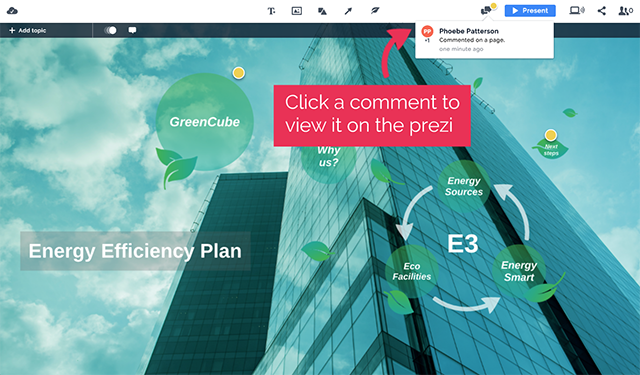 In your dashboard, rollover the presentation you want to add comments to and click Present. 3. Once you exit full screen, you’ll see yellow dots if there are comments. 4. Click on a comment to view it. If you want to respond, just type your text into the field and hit ENTER. 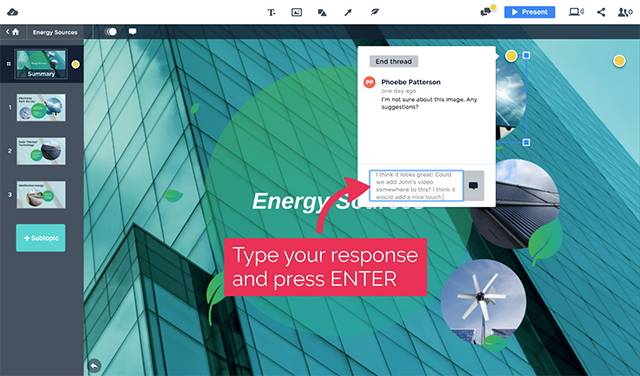 Once you respond to a comment, the owner of the presentation and any user who has been tagged or has commented will get a notification.